Responsible for over 90% of all reported backaches, "non-specific" backache has no actual associated pathology. Massage therapy and soft tissue and exercise methods have been shown to be the most effective way of treating – and preventing – this widespread problem. 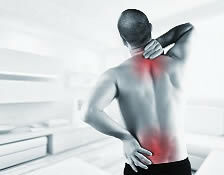 Through online text and video you will discover the evolution of "non-specific" backache as well as assessment and treatment methods ideal for use in combination with massage therapy derived from physical therapy, osteopathic and chiropractic sources. The supplemental videos demonstrate the palpation and treatment methods for learning enhancement. Identify contributing factors and the cost of non-specific back pain. State characteristics of phasic and postural muscles. 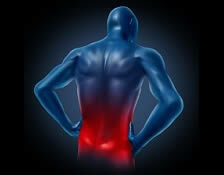 Give examples of beneficial treatment options for back pain. List signs and symptoms occurring in conjunction with non-specific back pain that may not be indicative of musculoskeletal dysfunction. Describe the different types of trigger points and their locations responsible for back pain. List questions to ask to measure trigger point pain. Explain the tools used for measuring and recording back/pelvic pain. Describe the various tissue levels associated with pressure palpation of trigger points involved in back pain. Locate the region of the spine most susceptible to non-specific back pain. Discuss the role of muscle fatigue in non-specific back pain. Demonstrate various functional assessments that provide information about the condition of muscle(s) involved in non-specific back pain. Describe how pain and discomfort arise in pelvic and abdominal viscera and which structures are involved in this pain. Explain the main tests used to identify ISJ and SIJ problems. State characteristics of somatic dysfunctions. Classify various levels of pressure, direction, and patterns used in various palpation assessments and techniques for their release. Describe characteristics and features of the Positional Release Technique, Neuromuscular Technique, and Muscle Energy Technique. List objectives of outcome based massage therapy for low back and pelvic pain. Select the quality of touch and force used in massage applications for the relief of low back and pelvic pain. Explain the purpose of joint movement methods used in the treatment of low back and pelvic pain. Discuss the use of massage strategies and techniques for addressing specific muscles, joints, and connective tissues involved in low back pain. Identify core exercises designed for stabilizing abdominal musculature. Review self-care exercises that focus on balance and stability. Explain how progressive adaptive changes to soft tissue become stressors that can lead to dysfunction and pain. Information was very detailed and the added videos were very helpful. Thanks ! This course had so much information, that it was amazing and a little overwhelming. I think it should be an 8 to 10 hour ceu class!!! I really will need time to assimilate all the information, but it was great quality! Thank you for such a quality class! This material was incredibly thorough and so well written. Videos are great too. Hopefully, I will be able to access the info periodically. Best course I've taken so far, ever. Thanks !! Overall the course contained information that is relevant and interesting. I would like the video to be more clear especially when showing thumb techniques it was barely legible. Otherwise, I found it very helpful and informative. Thank you. I felt the course was informative and comprehensive. I think it should be a 10-12 hour credit course. To read all the pages of text, view all the videos enough times to retain it, and review the text and videos to commit the information in each topic to long-term memory, not just short term memory takes longer than 3 hours. I have found all your courses of study to be well worth the time and money invested in taking them. I found the information on the videos especially very informative and helpful. The materials were very specific and easy to read and understand. There was a few questions I had a hard time with but overall it was an educational CEU course. I found this course to be helpful and interesting. I would recommend it anyone looking to add skills to their practice. Nice course, I learned a lot and refreshed previous knowledge. Great course, great videos, will use in my practice! There is definitely a wealth of information in this course. It's one of my favorite courses that I have taken. I have already incorporated some of the techniques into my massage practice. This course has quite a bit of information. The videos made the class more interesting. The course material was a bit of a difficult read. I would recommend this course for those wanting to learn evaluation of muscle, techniques. I found the course to take me many hours to complete. I found the test to be a high degree of difficulty, but the test did ensure an understanding of the subject matter. I love this course and plan on more extensive study on the subject. Thank you! I found this to be the best online continuing education course I have taken. The material is extremely detailed and dense with information, in addition to there being many useful videos. However, as a result of all this useful content, I found that the course took FAR more time than the allotted six hours. I am a fast reader by any standard, but it took me a minimum of 16 hours to cover the course material in a way that I could begin to absorb it so it is useful to me. It's a great course, but I would assign it more hours so that one can obtain the credit that it's worth as well as allow a reasonable amount of time to complete it if one is on a deadline. Great class! I learned many new techniques and will definitely be able to apply them to my practice. This class is very detailed. This is a great program. I will surely be taking my next courses on here! I really enjoyed being able to participate in this class. Back in the early "90's" I had the opportunity to take a couple of workshops with Leon Chaitow. He was a remarkable teacher with wonderful insights. This is a great class! Great class. Brushed up on techniques I knew as well as learned some added bonuses! I found the course very informative. Valuable descriptions of problems that might mimic muscle issues. Enabled me to be able to put into use some tests I had learned years ago, but didn't really know what the results meant. Great course. This is quite thorough. I teach yoga as well as work as a massage thrapist. It is quite beneficial to both! Good course. Lots of good information, and many other techniques to incorporate in my work. Good program. Wish I could have watched the videos on disk instead of going online. Some of the videos were poor quality by way of being blurry & sound was hard to hear for most. Had to turn up speakers very loudly to hear most.